A tummy tuck, technically called abdominoplasty, is a surgical procedure that removes the excess skin and tightens the muscles of the abdomen to give the stomach a flat and firm look. To achieve maximum results after a tummy tuck surgery you should incorporate a healthy lifestyle that includes a balanced diet and an exercise program into your life. If you are in good physical and mental health with reasonable expectations you should be an appropriate candidate for tummy tuck. laxity, especially just below your navel, you may be an appropriate candidate for a mini abdominoplasty. Through a small incision hidden in the pubic area, only extra skin below the navel is removed. If you have extra skin above and below the navel, a traditional abdominoplasty (tummy tuck) is performed. may be a candidate for an extended abdominoplasty (extended tummy tuck)﻿. This surgery lifts not only the abdomen but also the lateral thighs and buttocks. The incision extends around to the back of the body. Dr. Wilson will review all of your surgical options at the time of your consultation. You should come to the consultation prepared to discuss your medical history. This will include information about any medical conditions, drug allergies, medical treatments you have received including previous surgeries and medications that you currently take. How is a Tummy Tuck (Abdominoplasty) performed? There are many types of abdominoplasties and body lifts, from mini to extended. Dr. Wilson will determine which is best for you at the time of the initial consultation. Elements that will influence the decision include your body habitus, amount of redundant skin and adipose tissue that you have in your central abdominal wall and central trunk area. 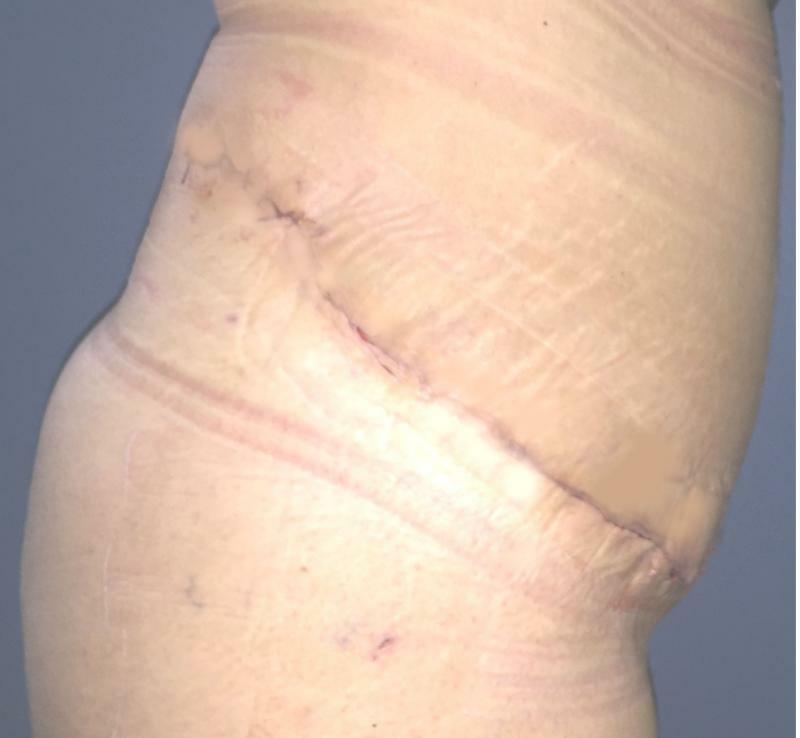 In a “mini” abdominoplasty (mini-tummy tuck)﻿, a small scar 10 cm long is used to access and remove extra skin below the umbilicus. In “extended abdominoplasty”, an incision is made circumferentially around the waist to remove excess skin and restore the diameter of the waist.In almost all cases, Laser Liposuction of the upper part of the abdomen is performed. 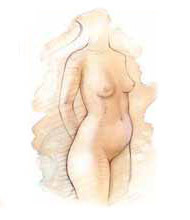 Note extent of skin removed and disappearance of the frontal bulge and love handles as well as restoration of the waist. Full Abdominoplasty, Laser Liposuction for Upper Abdomen and Waist Restoration: for a 34-year old female with marked abdominal obesity, huge breasts and redundant tummy. 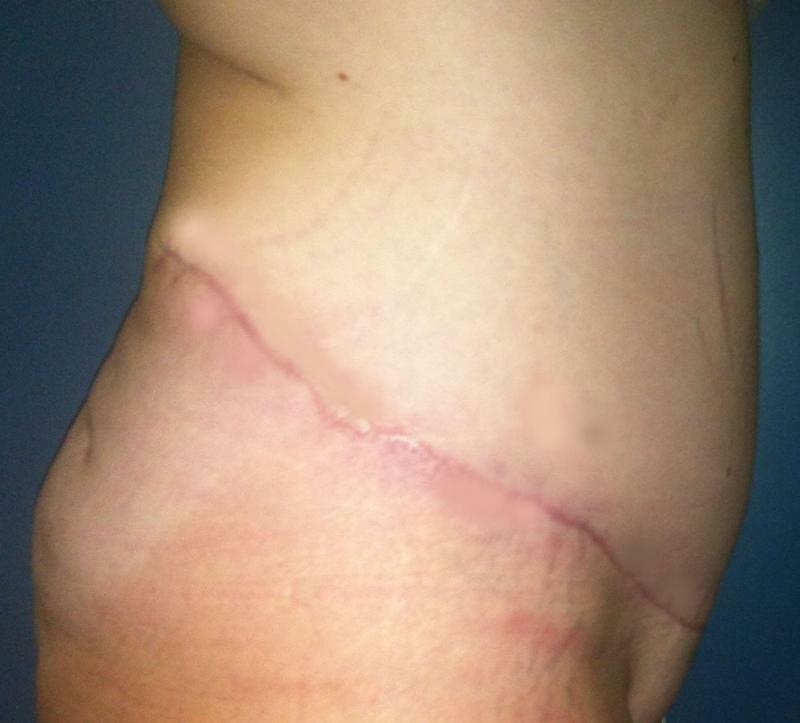 Note the waist restoration and inconspicuous scars after the surgery. Extended Abdominoplasty, Laser Liposuction for Upper Abdomen and﻿ waist restoration: for a 54-year old female with marked abdominal obesity . 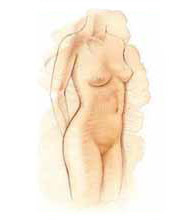 Abdominoplasty, Laser Liposuction and waist restoration: for a 32-year old female with marked abdominal obesity. 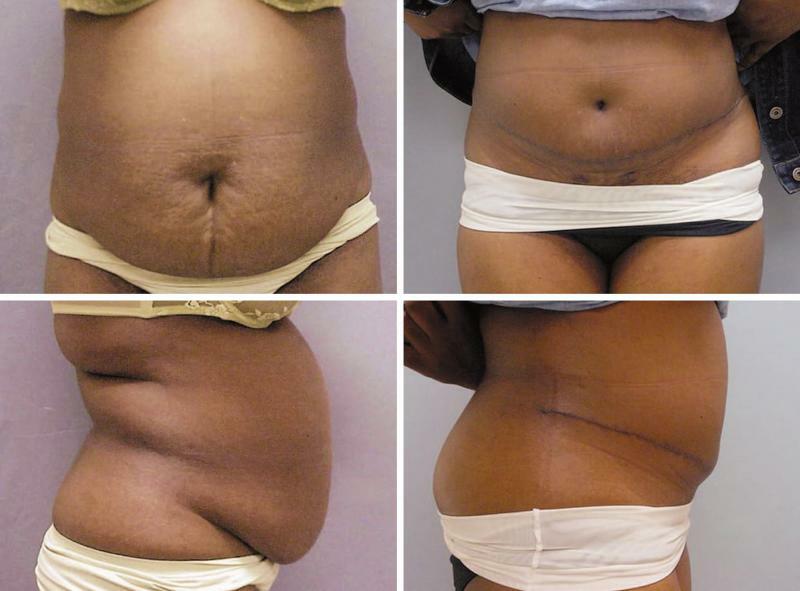 Mini-abdominoplasty, Laser Liposuction for Upper Abdomen﻿ and waist restoration: for a 25-year old female with Redundant abdomen after repeated Caesarian Sections. 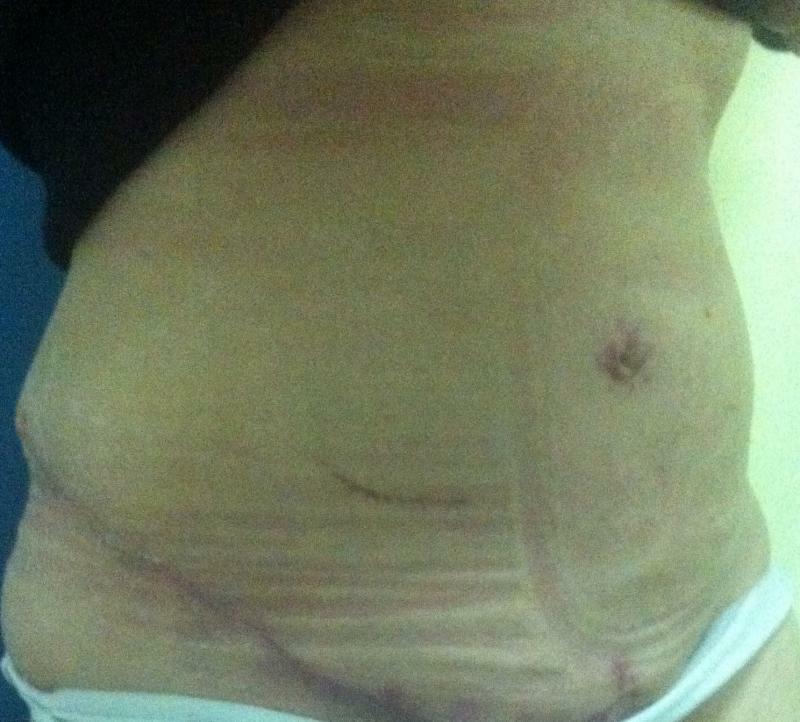 Full formal abdominoplasty: to treat redundant abdominal apron in an obese 42-year old female. Note the marked improvement on the frontal and side views. Full formal abdominoplasty and Laser Liposuction for Upper Abdomen﻿: to treat redundant abdominal apron in an obese 58-year old female. Note the marked improvement in abdominal contour. A concommitant breast reduction and lift were performed. 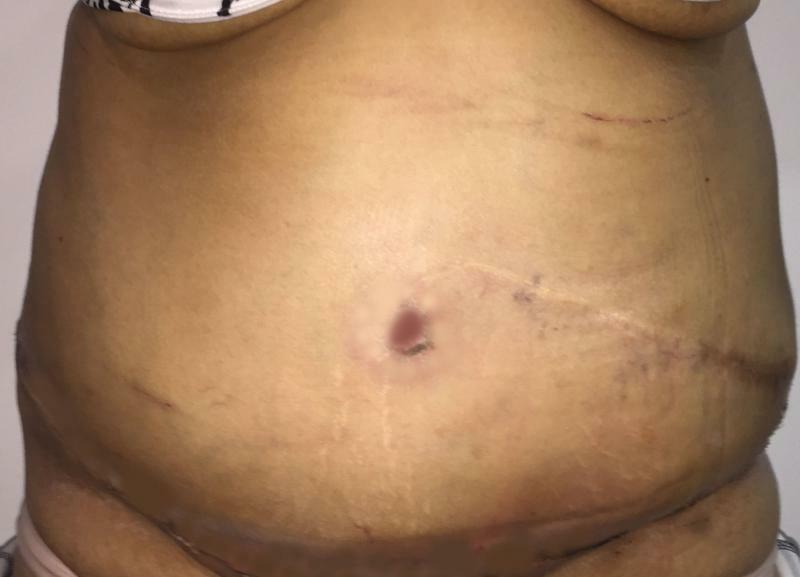 Full formal abdominoplasty, Hernia Repair, and Laser Liposuction for Upper Abdomen﻿: to treat redundant abdominal apron in an obese 56-year old female. She had an incisional hernia in the left flank, that was also treated. Note the marked improvement in abdominal contour. Full formal abdominoplasty and Laser Liposuction for Outer Thigh﻿: to treat redundant abdominal apron in an obese 48-year old female. 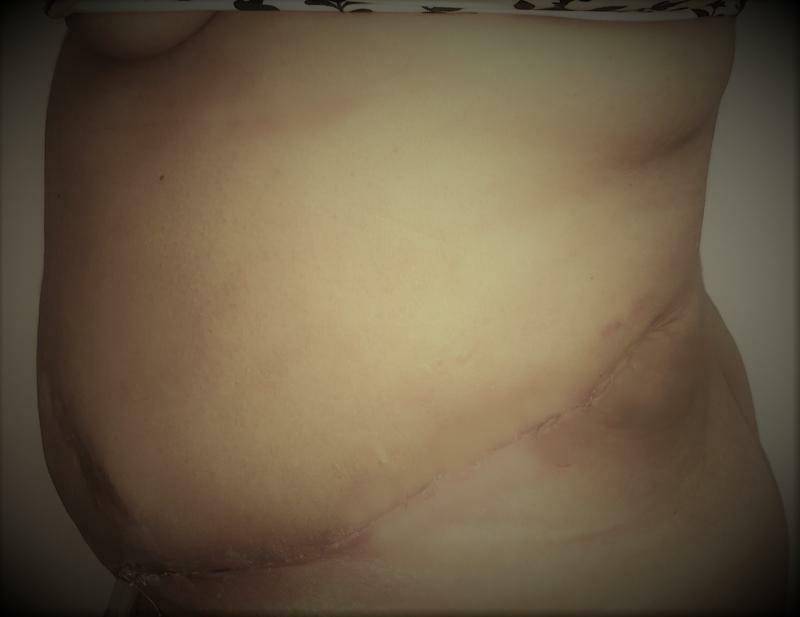 She had a vertical scar from previous abdominal surgery, and this was removed during the abdomionlasty. Note the marked improvement in both abdomen and outer thigh. Full formal abdominoplasty and Laser Liposuction for Upper Abdomen﻿: to treat redundant abdominal apron in an obese 49-year old female. Note the marked improvement in both AP and lateral views. Full formal abdominoplasty and Laser Liposuction for Upper Abdomen﻿: to treat redundant abdominal apron in a 52-year old female. Note the marked improvement in waistline, abdominal bulge and love handles.